Forte VFX1 was the most advanced, complex and expensive consumer VR system that appeared on the market during VR craze in mid-nineties. Introduced in 1995, VFX1 was in the shops all around the world in 1996. To make this all stuff work – system’s “VIP” card need to be installed into ISA slot of the host PC. VIP card worked in pair with PC’s video-card connected via VESA bus to provide stereoscopic imagery on both screens of the HMD. VIP card also processed all the tracking data, and redirect sound to headphones. It also introduces Access Bus hub. VFX1 was one on the first VR systems that were sold in former USSR countries. It was very pricy for common consumers here (with starting price in Moscow – 1495 USD), but nevertheless exported VFX1 systems were sold in big quantities. Many years after I was lucky enough to get my hands on such complete exported package, originally sold in Moscow, it have additional Russian manual not included in traditional US version. Let’s take a close look on VFX1 packaging arrangement. VFX1 was packaged in relatively small box (38x33x34 centimeters), with bunch of colorful pictures and a lot of self-advertisement, but its Virtual Reality isn’t it? Here, take a look. My box was damaged a little – plastic handle was broken, so for transportation purposes box were glued with scotch tape. Buy a VR system and get free CD-ROM! Hell yeah, funny today but in 1995 this message had sense. 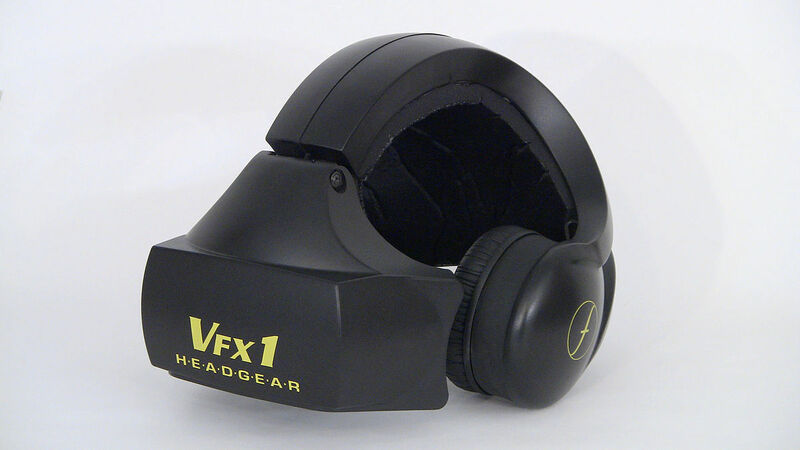 VFX1 helmet was somehow bulky but well designed and well balanced; nowadays many VR enthusiasts put modern HMD internals in VFX1 shell for comfortable fit. Personally I prefer modern glasses-like design, but I admit – VFX1 sit’s pretty comfortable on my head. VFX1 helmet had “smart visor” that can be opened to allow user to look at the outside world, while not taking off whole helmet. This visor working pretty similar to VPL EyePhone visor which were used in “Lawnmower man” movie. Visors optics are adjustable, you can change IPD and focal distance for each eye independently. There are no knobs or something to change IPD, you need to gently move oculars along the internal rails manually. Also rubber eyepieces on the oculars are easily detachable. Glass optics upgrade was available for additional price, unfortunately nearly impossible to found improved VFX1 oculars today. Insides of the helmet covered with detachable soft foam glued-over with fabric. Is gyroscopic joystick, hold in mid-air, designed to play VR games while standing on foot, absolutely great with Quake. It have 2DOF tracker (Pitch and Roll), and 3 programmable buttons. Pretty neat accessory, too bad it utilizes Access Bus connector and it’s impossible to use it on modern PC’s without being re-wired. Among other accessories that can be found in package – is helmet head-strap, 2.5 meters VFX1 data cable, original Forte floppy disk with drivers, and user manuals. VFX1 data cable is actually standard RS-232 26 pin Male-Female cable, which is very flexible. Nowadays it’s very hard to find such cables as spare part, even in specialized cable shops. Pretty good ad for a 1500 bucks device isn’t it? I suppose this was one of the show stoppers for VFX1, who will spare so much money on the gaming device that you can’t use more than 15 minutes at a time? But, it was good and pretty functional limitation for gaming arcades, where people play for short periods of time. As mentioned earlier VIP board need to be connected to ISA slot, provides Access Bus hub, processes tracking data from head tracker and from cyberpuck. Through VESA connector it provides video signal to helmet. Access Bus was actually a predecessor to more useful standard – USB, it also provided possibility to connect many devices through the hubs (and through each-others), make hot connections on already working system (yep, that was a big step forward in RS232 COM era). However Access Bus didn’t stayed long, and I know only one device that uses it – it’s Cyberpuck. In my system VIP card is connected via VESA to S3 Trio, it’s the most powerful video-card that provided proper VESA signal, compatible with VFX1. I found mentions from VFX1 users that proper VESA was also on Voodoo Banshee 3D accelerators, but I didn’t have this card and can’t test this. Cyberpuck can be connected to VFX1 helmet or directly to VIP card. I prefer HMD connector because it allows playing on foot. We examined particular components of VFX1 system, and now let’s connect them together and take a look on the visor’s imagery. VFX1 works in Windows only in 640 x 480 x 256 colors mode. Actual LCD’s (789x230 color elements) can provide wider range of colors, but utilizing VESA for transferring image to HMD – limit’s it to 256 color palette. But, this palette isn’t fixed, it’s optimized, this means that it holds any color from true-color palette, as long as palette length itself no longer than 256 colors. My VFX1 unit was used frequently in the past, but LCD’s are still bright and colors are vivid. I’ve tried to take a few shot’s of what can be seen through VFX1 optics, it is much sharper and with fewer distortions in reality than on these photos. But anyway take a look on the desktop and on a few game-shots from Quake, Descent, and Heretic. These games are my favorites for VFX1, especially Quake1 which gives great immersive feeling even today. By the way VFX1 do not utilize depixelation filters (in contra verse to many professional HMD’s at the time), so black-spacers between pixels are clearly seen. For stereoscopy, VFX1 supported two formats of input video – line sequential, and horizontal stereo-pair. While for running VFX1 in stereo-pair mode you need to use proper software, you can set VFX1 to force line sequential mode in windows configuration software, or use command line “VFX1.COM +t” to turn it on in DOS. VFX1 have drivers compatible with DOS, Windows 95 and Windows 98. I’ve installed VFX1 in Windows 98 SE system, and it works there without issues. After hardware installation, you need to properly configure VFX1 software to make it work. When installing software, you’ve instructed to set IRQ settings according to DIP switches positions on VIP board. You can also check tracking for HMD and Cyberpuck. Personally I’ve liked VFX1 DOS software more for its fancy graphical 3D look, but Windows version of VFX1 configurator work pretty the same. One of the features that I liked in VFX1 better than in its “grandson” –VR920, that tracking need to be calibrated only once, software calibrate magnetometers automatically you only need to choose your geographical region. After calibration – VFX1 tracking worked perfectly for me, and there’s no need in further recalibration. To make game to support all VFX1 features you need to have proper game patch, in rare cases game have built-in VFX1 support (like Descent, System Shock or ZAR). In all other cases you can use VRMouse – native VFX1 mouse emulator, which emulates mouse and key presses for trackers and buttons of Cyberpuck. VFX1 had many benefits in its release time. Other consumer VR systems at that time provide fewer features; all of them were without any sort of game-controller that allow you to play standing on foot, sometimes with lack of good head-tracking (like “CyberMaxx”) and stereoscopy support (like “Philips Scuba”). Only “I/O Glasses” had both 2DOF tracker and stereoscopy, but it lacked in game support at the moment of release and had inferior picture quality. Besides VFX1 had biggest FOV among other consumer HMD’s. Overall VFX1 offered immersive experience and wide support of currently available games at the time. Stylish, comfortable and well balanced HMD design received positive critics and very soon in many countries VFX1 helmet was associated to Virtual Reality itself. However, VFX1 had list of fatal design flaws caused by its early production – this includes ISA interface VIP board, utilization of VESA which limited it to 256 colors palette, and Access Bus which pretty soon was out of the game in favor to USB. To overcome some of the flaws, Forte released “Linkbox”, which allow VFX1 connection to regular VGA outputs, but linkboxes were made in very small quantities, and nearly impossible to find nowadays. Also linkbox provided to VFX1 only video signal, without tracking, which make it pretty useless. Rumored full-feature linkbox were never created. As possible schema to run VFX1 on modern systems – is to use old host PC with VIP card installed, provide video signal to it through video capture card (some old TV tuner), and using Forte VFX1 SDK (which is available) to program VRPN drivers to get tracking info via network. After releasing VFX1, Forte was renamed to IIS, and in 1998 they released VFX3D – successor to VFX1. Fully copied external helmet design, VFX3D get rid of ISA VIP card, instead it had control box, with regular VGA connection to PC. Instead of using Access Bus to carry tracking data – VFX3D sent tracking data via COM port, which became obsolete nowadays too. VFX3D doubled the resolution of VFX1 (360k subpixels instead of 180k), had better color reproduction, but had much lesser FOV (35 degree instead of 45 in VFX1) and fixed optics. VFX3D also lacked Cyberpuck, which is on my opinion – a step back. Even with overall better characteristics and compatibility, VFX3D were sold in lesser quantities. Years later IIS changed name to Icuiti, and focused on manufacturing compact video-glasses. However they designed a new gaming HMD, which working title was X-Viewer, afterwards changed to VR920. Before releasing VR920 in 2007 company changed its name again to Vuzix. Vuzix VR920 – almost tripled resolution of VFX3D (now it’s 920k subpixels, which is true 640x480 resolution), and completely changed its visual design to look like slim futuristic glasses which you can put in a pocket. VR920 have built-in 3DOF head-tracker, and can be connected to VGA or DVI with included adaptor. It supports input resolutions up to 1024 x 768, and drives power, audio, microphone, tracker, and stereo sync-signal via USB. VR920 have no control box, which make it pretty possible to use as mobile HMD for small PC’s or Netbooks. Latest software update for VR920 enables all its functions on Windows7 64bit OS. Currently Vuzix focused on multi-purpose Wrap series of portable video-glasses which lacks head-tracking for VR gaming. Wrap 6DOF head-tracking module is announced but yet not produced by company.